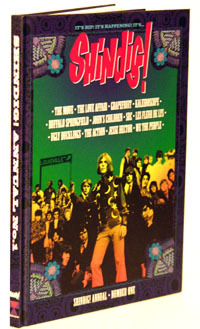 Here’s an ideal Christmas present for the late-60s music lover in your life – the first ever Shindig! Annual. Shindig! Annual No.1 is a 112-page hardback book, featuring a selection of articles that first appeared in the out-of-print Volume 1 series of Shindig! Magazine. All the features have been redesigned with new illustrations and extra photographs. Inside the annual are stories and interviews with The Move, Love Affair, Buffalo Springfield, Johns’ Children, Grapefruit, Kaleideoscope, The Action, Les Fleur De Lys, and many many more. The annual costs £12.50/£14.50 to Europe/£18 ROW, with a small discount on these prices for subscribers. You can place your order here. Meanwhile the next issue of the regular bi-monthly magazine is published on December 30th. If you haven’t yet brought a copy of Shindig! you can see what all the fuss is about here.